Madbury has joined a growing number of towns and cities using the state's tax incentive program to encourage historic barn preservation. RSA 79-D authorizes towns and cities to grant property tax relief to barn owners who can demonstrate the public benefit of preserving their barn or other older farm buildings, and agree to maintain them throughout a minimum 10-year preservation easement.According to data collected by the N.H. Department of Revenue Administration, by the close of 2017, 90 communities have enrolled over 556 historic structures in the program -- a 6.5 % increase over last year. Cornish, Freedom, Deerfield, Sandwich and Plainfield lead the state with the number of structures protected; Cornish and Freedom with 20, Deerfield and Sandwich with 19 and Plainfield with 18. Alton, Concord, Fitzwilliam, Henniker, Hopkinton, Kensington, Kingston, Lancaster, Lee, Loudon, Lyme, Marlborough, Moultonborough, New Boston, North Hampton, Orford, Stratham, and Weare all have between 10 and 17 structures protected under the program. “We are encouraged that 2017's percent increase in use of the barn tax incentive program is the highest since 2013,” said Beverly Thomas, Program Director, New Hampshire Preservation Alliance. “People across the state and their municipal leaders understand the significance of these historic structures, the opportunities to continue to use them in creative ways, and the value these barns bring to the scenic landscape of their communities,” she said. Promoting use of this tool was part of the Preservation Alliance’s 52 Barns in 52 Weeks initiative in 2017 that helped save more than 52 barns and increase public awareness with educational forums, planning grants and promotion of this barn tax relief program. More about RSA 79-D: Modeled after the state's open space discretionary easement program, the barn tax incentive allows municipalities to grant property tax relief to barn owners who can demonstrate the public benefit of preserving their barns or other old farm buildings while agreeing to maintain their structures through a minimum of a 10-year renewable easement. In return, the municipality provides tax relief of 25% to 75% of the full assessed value of the building and the land underneath it. And, importantly, the assessment will not increase as a result of maintenance or repair work that is performed while the easement is in effect. Carl Schmidt, chair of the N.H. Historic Agricultural Structures Advisory Committee, is encouraged by the continued growth of the program but also noted that "this important tool is still under-utilized and I hope that more barn owners and municipalities embrace this opportunity to help save an essential part of our state’s character." He commented that municipalities with strong barn preservation advocates or an active Heritage Commission or other group that helps guide Selectboards or City Councils can make a big difference in the use of this valuable tool. Barn owners interested in applying for the incentive to become effective in the coming tax year need to apply by April 15, 2018. Also of note is that easements that went into effect in the sixth year of the program (2008) for a ten-year term expire on March 31, 2018 unless a renewal application is received by the April 15 deadline. Property taxes on the relevant structures may then increase unless the easements are renewed. Applications for renewal, like new applications, must be submitted to your municipality on N.H. DRA form PA-36-A no later than April 15, 2018. Applications can be obtained from your town office or download an information packet with application from the Alliance’s web-site www.nhpreservation.org or call 603-224-2281. Applications are also available at www.revenue.nh.gov/forms/2010/documents/pa-36a.pdf. The New Hampshire Division of Historical Resources and the N.H. Historic Agricultural Structures Advisory Committee work with the Preservation Alliance to provide barn assessment grants, publications, tours and workshops, an information network, and a voluntary survey program. The N.H. Historic Agricultural Structures Advisory Committee was established by state legislation in 1999 to support the preservation of N.H.’s historic barns and agricultural structures. The committee is comprised of representatives from state agencies, non-profit organizations and agricultural leaders. Learn more about the preservation saga of this barn that is enrolled in the RSA-79D program here. 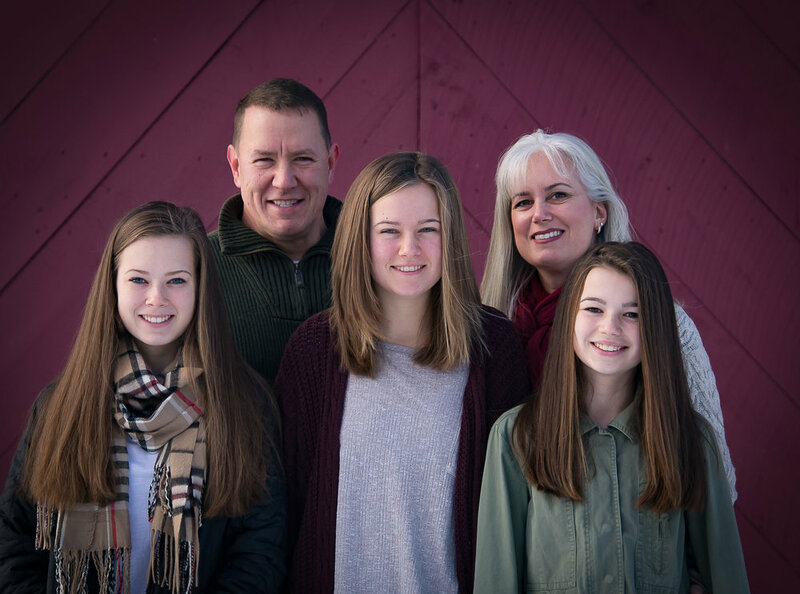 Since becoming stewards of their family barn in 2016, Therren and Alissa Welch have heard countless fond memories from people in Raymond about the c. 1880 barn, from playing basketball on the second floor to line dancing and more. 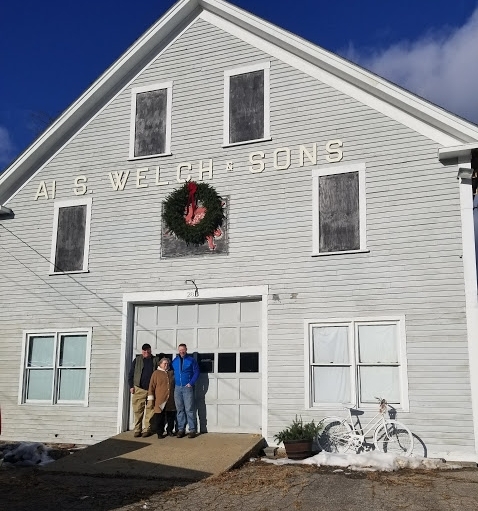 Known as the former AI S. Welch & Sons Oil Company building, as reflected by the signage above the door, the barn has been in the Welch family for the better part of a century. Originally a livery stable and later the home to the oil company, the building has sat empty without a use for well over two decades. We’re highlighting this barn as one of 52 Barns in 52 Weeks because of its past significance to the community and the new owners’ commitment to its history and preservation. “Some people identify family heirlooms with a watch, jewelry, or fine china. Whatever the piece is, we appreciate the craftsmanship and ingenuity of past generations. My heirloom happens to be an 1880 balloon framed, wood barn with its majestic cupola and weathered brass weathervane. As it stands, my barn is a little rough and in need of some love and care; but what I see is a glorious and prominent structure with its bright brass patina of the weathervane shinning in the sun that will stand for another 5 generations. Now is my turn to embark on a new segment for this great structure and continue my family’s pride,” said Therren of his newly acquired barn. The Welches began work on the 35’ x 50’ Yankee barn in March of 2017, cleaning out the building and assessing the needs both structurally and aesthetically. Repairs have included work on the windows, adding support beams to the main floor, and removing false ceilings, walls and the furry inhabitants that were within them. 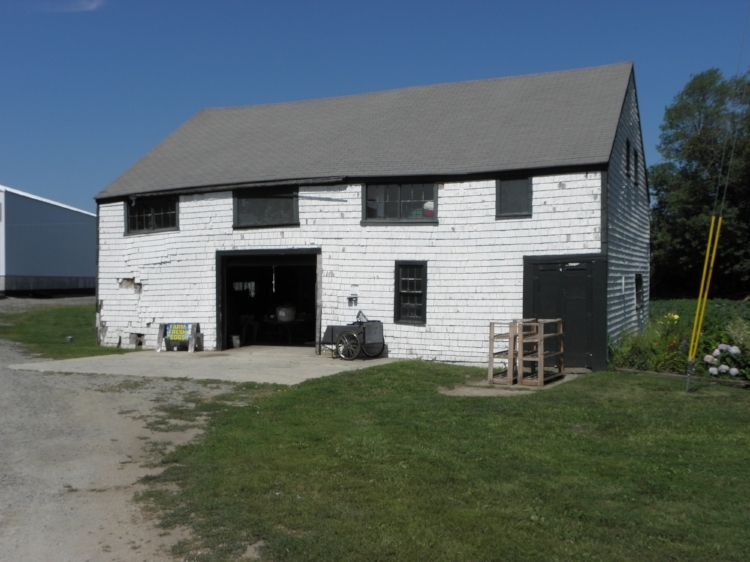 After reading about the 52 Barns in 52 Weeks initiative, the Welches applied for and received a mini-grant from the Preservation Alliance to have a professional assessment done by contractor Ed Pape, to help direct them with their rehabilitation work. The remaining work includes installing electricity, replacing deteriorated structural members in the basement and second floor, repairs to the cupola which is original to the structure, as well as replacing the roof and repairing the siding. The goal is to keep the building’s appearance as close to original as possible. Upon completion of this work, the Welches plan to open the first floor of the barn as a small coffee and wine shop. There has been much excitement within the community as repairs are made to the barn. Our goal of 52 Barns in 52 Weeks has been to help at least 52 barn owners across the state with assessment grants, assistance in securing tax relief, and educational opportunities to help save their historic barns, and we’ve exceeded our target. Throughout 2017, barns and their owners have been showcased by the Preservation Alliance to celebrate good work and offer practical information and inspiration to others. We are grateful to all of our donors to date, and encourage others to add their support with an investment in the 52 Barns in 52 Weeks campaign so we can do more! Young New Durham Family Honored to Share in Preservation Efforts – One of 52 Barns in 52 Weeks. Curtis and Stephanie Richard purchased their property in late 2013. The property, located in New Durham, boasts an antique cape-style home, open field and forest, and a weathered, yet well-built 30’x30’ post-and-beam barn. “We love it here; New Durham is a welcoming community that really embraces its history and its rural identity. We are so grateful for the many conservation and preservation efforts in our neighborhood, town, and state and are honored to be able to share in those efforts as we maintain and restore our own barn,” said Stephanie. The house dates to c. 1790 and the barn was likely constructed around that time as well. The Richards have a county map dated 1856 that shows the home and barn and labels the owner as “L.H. Pinkham”. The neighborhood was once known as “pig pen corner,” so the property was likely home to pigs or other small livestock. We’re highlighting this barn as one of the 52 Barns in 52 Weeks to celebrate the Richard’s commitment to the stewardship of the building as they continue its agricultural use. The barn currently supports the Richards in their efforts to produce meat and vegetables for their growing family. The couple raises chickens, ducks, and pigs, tends two large gardens, and enjoys fruit from the property’s mature apple trees and blueberry bushes. The barn serves as storage, a workshop, a potting shed, and a winter home for their cats and chickens. The couple has also used the barn as entertaining space for their wedding reception and birthday parties. Renovation of the barn will greatly increase its usefulness, as the leaking roof and deteriorated siding now allow easy entry for the elements and wildlife. The goal of this 2017 initiative is to help at least 52 barn owners across the state with assessment grants, assistance in securing tax relief, and educational opportunities to help save their historic barns. Throughout the year, barns and their owners have been showcased by the Preservation Alliance to celebrate good work and offer practical information and inspiration to others. The Scammans of Stratham will continue their stewardship of a family farm that dates to 1665 with repairs to a c. 1750 barn, the oldest structure we’ve showcased during our 52 Barns in 52 Weeks campaign, and one of the oldest documented barns in the town of Stratham. This whitewashed, English style barn is part of the Scamman Farm, a local landmark on Route 108. 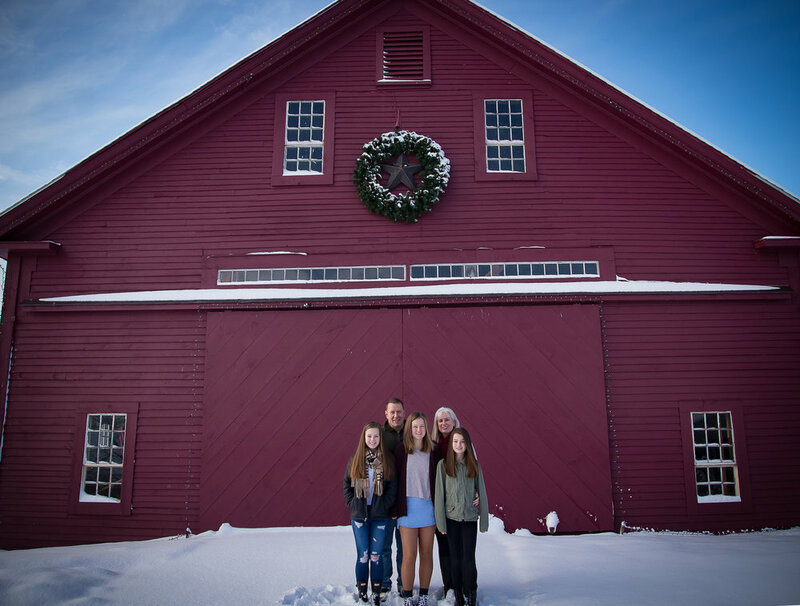 “We love the farm, the old buildings, have added over 200 acres of our land into conservation with the goal to keep agriculture alive along with preserving history for the Town of Stratham,” Stella Scamman writes of the farm her family has been operating since the 1970s. The farm dates to the mid-17th century when Richard Scammon (a distant relative) settled the land. Stella Scamman and her husband Doug, along with their children, ran it as a dairy farm from the 1970s to 1999. The property is now run by the next generation as a hay and pumpkin farm with seasonal features that engage the community, including a 6+ acre corn maze, farmers market, and school visits. The Scammans applied for a grant from the NH Preservation Alliance in order to assess their 32’ X 44’ barn. Like many barn owners, and especially those with a working farm, they are looking to make “needed repairs in the most efficient and cost effective way that will retain the historical character of the barn while making it fit for continuing use.” Currently it is in use as storage for equipment, and for honor system egg sales. There is evidence that this barn has had many uses in its three centuries, such as for housing chickens, apple storage, and potting and planting. Its loft, running the entire length of the barn, is accessed by a wide substantial staircase that indicates it was built for storing hay, grain or other produce. The mini-grant from the Preservation Alliance introduced the Scammans to antique building specialist Bob Pothier of First Period Colonial Preservation/Restoration. Pothier found the early hand-hewn frame to be in good condition, so he recommended that the repairs should start with addressing the sinking fieldstone foundation. The foundation is in poor condition, covered almost entirely by earth affecting the corner posts and sills, causing the walls to bulge and joints to pull apart. The Scammans have plans to move forward with these foundation and sill repairs. Repairing this barn is phase one for the Scamman Family. Their next goal is to rehabilitate the adjacent larger mid-19th century Yankee style barn. The farm was determined eligible for the National Register of Historic Places in 1998. “The surviving farmstead complex retains its original integrity remarkably well,” says Nathan Merrill, chairman of the Stratham Heritage Commission. “The rambling Greek Revival house, English barn, Yankee barn, and chick hatchery all remain in the original, compact farmstead area. While the surrounding landscape has changed dramatically with commercial development over the past 50 years, the Scamman Farm remains a scenic oasis that is enjoyed by the tens of thousands of people who travel Route 108 every day.” The Scammans plan to work with the Heritage Commission to move forward toward the National Register listing in 2018. The goal of 52 Barns in 52 Weeks is to help at least 52 barn owners across the state with assessment grants, assistance in securing tax relief, and educational opportunities to help save their historic barns. Throughout 2017, barns and their owners have been showcased by the Preservation Alliance to celebrate good work and offer practical information and inspiration to others. The timber frame barn consists of a major rafter/minor purlin roof system, dropped wall plates with continuous ty beams and a hay track with fork at the ridgepole. Besides the barn and house, the property includes an English style barn (once used as a carriage house), summer kitchen (perhaps the original house), a sap house, a three-seater outhouse, and a sheep shed. The Twombleys applied for and received an assessment grant from the Preservation Alliance made possible by donors to the 52 Barns in 52 Weeks campaign. Barn contractor Ed Pape visited the property and drew up a report prioritizing the barn’s needs and offering suggested repairs and rough cost estimates. The Twombleys, who are both disabled, will use the report to determine which projects will require a professional and which they can attempt on their own. The homestead was the first established in Wakefield (then called East-town) by way of a “Masonian Grant”, a land grant issued by the King of England, with stipulations that family(s) must winter over, build a structure, clear pasture and get other families to join them in settling the area. The original owners were Jonathan Gilman and family, who maintained the farm for several generations starting in 1767. Gilman was known for his participation in the Revolutionary War as well as his interest in community and church. By the mid-1900s, Paul’s grandparents William and Fran Twombley had become stewards of the property, and along with their four sons they raised animals, grew crops and made maple syrup here. They were community-minded and interested in celebrating the agricultural heritage of the region. They served as town leaders, were active in the Grange, and helped establish the NH Farm Museum in Milton. The couple also welcomed local grammar school children for field trips to tour the farm and planted pumpkin patches so local children could come PYO. Paul and Juliana have a similar mindset and would like to reinstate the connection to the community, including inviting schools for field trips. They think it is important for children to see a working 250-year old farm, interact with farm animals, and explore both continuity and change through the centuries of this homestead. Aspiring to be self-sustaining, the Twombleys currently have organic gardens (they sell their produce at local farmers’ markets) and hope to bring livestock back to the farm, once the barn is ready. For now, they have Vietnamese potbelly pigs and an elderly rabbit named Izzy. They would like to add chickens, donkeys and alpacas. The Twombleys have raised several litters of rabbits on this farm, including a Flemish Giant Angora mix, whose soft hair Juliana spun into yarn. The couple has done a lot of maintenance and repair already, including restoring old windows – thanks, in part, to their participation in a NH Preservation Alliance window restoration workshop. They have a New England spirit of conserving resources and neighbors-helping-neighbors and are grateful for the help they received from the sustainability non-profit organization Global Awareness Local Action (GALA), and the Carroll County community and folks as far as Salem, Alton, and Portsmouth, who have donated surplus shingles, tar paper and nails in order to fix the barn's south roof. The materials currently lie in wait as the couple considers how to complete the work on the 12 pitch roof. The commitment and creativity the Twombleys show in working to restore both their barn and their farm are commendable given their limited resources and health issues. Along a well-traveled road in Stratham is a historic farmstead with a 40’x60’ New England style barn. The red barn with surrounding hayfields is a much admired local landmark, especially in the fall with its backdrop of foliage and during the winter season when it's adorned in holiday lights. Two years ago the Bartel family purchased the property. The New Hampshire Preservation Alliance is highlighting the Bartels and their barn because of their commitment to preserve this local landmark for future generations with help from the Alliance’s 52 Barns in 52 Weeks initiative. “We take a personal responsibility to not disappoint all of the previous owners over the last 277 years (house built in 1740) and 187 years (barn estimated at 1830) whose attention to detail, meticulous upkeep, maintenance and pride in ownership show today. It's amazing to think that this barn and house have withstood everything thrown at them from war (Revolutionary war through today, with a close call P-51 crash in the field during WWII) to weather (multiple hurricanes, countless snowstorms, and a flood or two) to fire...it's truly amazing they still stand today. We intend to maintain that tradition so the owners in 2100 can say the same,” said Matt Bartel. The Bartels, uncertain about the quality and integrity of some of the repairs to the structure through the last half-century, applied for and received a mini-assessment grant that brought barn consultant Bill Coleman, The Barn Whisperer, of Pelham, to the property this summer. Coleman was pleased with the condition of the barn and called it a great example of a transitional building style. Barns in the 19th century were not architect-designed, but rather, were built by local hands, with local materials and a knowledge of traditional methods learned from neighbors and prior generations. This barn is an example of all of that coming together in the best possible way. The c. 1830 barn was originally built to house a herd of dairy cows. In addition to the dairy herd of the 19th century, the barn has likely held an assortment of other livestock, and, more recently, was used to support a horse farm. The milking room is still within, but a silo and other outbuildings were taken down due to their poor condition. The early New England barn frame includes English tying joints, flared oak posts, pass-through purlins, and built-in loft ladders. The house associated with the property was built in 1740 by Nathaniel Wiggin. The surrounding fields, no longer a part of this property, have recently been protected under a conservation easement. The fields are now harvested for hay. With the new information and recommendations from Coleman's site visit and assessment report, the Bartels plan to begin repairs in order to use their barn for a variety of purposes, including a machine shop and storage, as well as a dance floor in the upper levels for “three teenage Irish step dancers,” -- certainly a new use for this old barn! The Bartels are still considering what, if any, livestock might move in once renovations are complete. Currently, the barn houses a couple of barn cats who pull their weight by keeping out the riff-raff. The Bartels would like to restore the barn as they and previous owners have done with their historic house. The mini-assessment they received from the Preservation Alliance will help steer them along the way and enable the barn to continue to be used and admired for generations to come. The goal of 52 Barns in 52 Weeks is to help at least 52 barn owners across the state with assessment grants, assistance in securing tax relief, and educational opportunities to help save their historic barns. Throughout 2017, barns and their owners are being showcased by the Preservation Alliance to celebrate good work and offer practical information and inspiration to others. Jason Mutschler and Abigail Strauss immediately felt connected to this c. 1870 barn in Warner Village which they purchased about a year ago. "We are so excited to be the next caretakers of this special place. There is something unique about it, among the mismatched but perfect rafters," said Strauss who grew up in an old house in Jaffrey and attended school in farm structures during her preschool and elementary years. Mutschler and Strauss reached out to the Preservation Alliance for some help and were awarded a barn assessment grant in the Alliance's second grant round of the 52 Barns in 52 Weeks 2017 barn initiative. Preservation contractor Ian Blackman visited the barn and created a professional "road map" for repair or re-use made possible through generous donors to the campaign. The couple’s attendance at a summer barn repair workshop also allowed them to gather information and connect with other barn owners, and they’ve started some preservation projects. The New Hampshire Preservation Alliance is highlighting this couple and their barn because of their commitment to preserve this local landmark for future generations with help from the New Hampshire Preservation Alliance’s 52 Barns in 52 Weeks campaign. Mutschler and Strauss’ long-range plan is to rehabilitate this historic 50’ x 36’ structure to use as a workshop, and for storage and entertaining, while maintaining its 19th-century charm. The structure needs their investment to address critical foundation, sill and framing needs. The barn and farmhouse were originally built by George F. Quimby, a local farmer as recorded by the 1870 U.S. Census. Like most town farmers with smaller lots, Quimby probably used the barn to house his livestock for personal use, with a little left over to sell to his neighbors. This was common with village barns: with a cow or two for milking, a horse for transportation, a few chickens, a pig, and some sheep, and storage of hay during the winter months. After Quimby’s death, the land passed to his wife Emma. The 1892 Hurd map shows subsequent owners including Edmund C. Cole, the first principal of the Simonds Free High School and owner/editor of the Kearsarge Independent newspaper for over 30 years. Cole then sold the property to Samuel H. Billings, who made some improvements to the barn before selling the property to S.B. Clark in 1925. Clark then sold the property to Horace Martin, who owned the IGA grocery store in Warner Village, that same year. The Warner Historical Society’s records indicate that Mrs. Martin still resided in the farmhouse as late as 1976. The couple is new to Warner but love their property and the community. “As soon as we looked at it, we knew it was our home," said Strauss. With the guidance and inspiration offered from the 52 Barns in 52 Weeks campaign, Mutschler and Strauss should have many happy years enjoying their iconic barn within walking distance of Warner Village. The Preservation Alliance wishes them well and thanks them for their commitment to preserve a piece of New Hampshire’s agricultural heritage. In Lyme, a group of enthusiastic and dedicated locals is working to restore an early 19th century English barn attached to the Churchill-Melvin House, at 15 Main Street, in the center of Lyme Plain Village. The Lyme Historians, which was organized in 1961 as a historical society and currently has nearly 300 members, purchased the landmark property in 2016 to serve as their new public museum. The group secured an assessment grant from the Preservation Alliance to map out a plan for the barn’s repair and conversion for educational use. The grant was made possible by donors to the 52 Barns in 52 Weeks campaign. The New Hampshire Preservation Alliance is highlighting this barn and this community project as one of our 52 Barns in 52 Weeks because of the visibility and significance of the place, and the group’s commitment to preservation “best practices” as they incorporate the old barn into their plan for expanded program space. The house was apparently built as the law office for Judge D. C. Churchill around 1850 (his home was across the Common). The first hundred years of owners—Churchills, Melvins, and Wests—were prominent citizens of this small town and also proprietors of the general store next door. Diaries indicate that nearly all of the locals shopped at the store, and photographs show a line of hitching posts along the boundary with the Churchill-Melvin House. The house and its barn have long been prominent buildings in town. The attached barn adds to the idyllic landscape of this small New Hampshire village. Its close neighbors include the Old Cemetery, an historic line of horse sheds, the former town jail, and the white-steepled 1812 church on the well-used and beloved Common. The barn and house are contributing structures to the Lyme Common Historic District, listed on the National Register of Historic Places. At present, structural and practical issues limit the options for using the barn to its full potential. Once rehabilitated, the Lyme Historians plan to use it for educational purposes, both as a good example of an early 19th century barn, and for exhibits or demonstrations of vintage farm-related items, as well as an event venue. The group received a mini-grant from the Preservation Alliance that provided for an evaluation by Richard M. Thompson of Sunrise Woodworks, of Cornish. Mr. Thompson gave them an oral report on his findings at the time of his visit, followed by a written summary as a guide for planning and restoration. The attached, three-bay, modified English style (eaves entrance) barn, measures 30’ x 40’. The barn held horse stalls, and in the cellar, had stalls or pens for pigs or sheep and storage. Close inspection during Thompson’s assessment dates the barn to ca. 1810 (pre-dating the house). This means it was probably moved and attached to the new house around 1850, a time when bank barns became popular. Moving a barn was not uncommon at the time. Thompson was impressed by the massive, hand-hewn first floor beams that are well-preserved after 200 years. Check out the Lyme Historians’ website for hours and information on visiting the site or to follow the restoration progress: http://lymehistorians.wordpress.com. The Lyme Historians are being deliberate about their restoration planning, and the visibility of the project in the center of the village will serve as a “good practices” example.